New evidence, including wood specimens dating back 4,800 years, discovered by a Hong Kong-Turkish team 4,000 metres above sea level, may suggest the existence of the biblical Noah’s ark. The team of 15, which included six Hong Kong evangelists and cameramen, said they had excavated and ventured inside seven large wooden compartments on snow-capped Mount Ararat in Turkey last October. The whole process was also videotaped for the first time. The team, which announced the expedition in Hong Kong yesterday, brought back samples from the sites, including wooden specimens, white seedling-like particles and remains of rope, which they believe was used for keeping animals. Yeung Wing-cheung, one of the team members, said a piece of wood 38mm long, obtained from the site, was dated as 4,800 years old by a carbon-dating method in Iran. This matches with the range of years stated in the Bible, suggesting when the vessel was built. Fellow researcher, Professor Oktay Belli, an archaeologist at the University of Istanbul, ruled out the possibility of human settlement because it has never been found above 3,500 metres. Dr Ahmet Ozbek, geologist at Kahramanmaras Sutcu Iman University in Turkey, said the low temperature and environmental condition of glacier deposits and volcanic material helped preservation at the site. The Ark has been buried under the ice atop the perpetually snow-covered Mount Ararat. A secret has been kept by a Kurds’ family over 4 generations in respect of the location of the suspected Arks’ remain. In 2004, the first Chinese expedition led by The Media Evangelism Ltd entered the military base and filmed the Ark’s remain in close distance. The footage of the Ark’s remain, including the supernatural experiences of the crew on the elevation of 4,200 meters of Mount Ararat will be shown to the public through this documentary film coming to the local theatres this Easter. To unveil the myths of the Great Flood and the Ark, the production crew had traveled to the USA, Canada, Israel, Australia, Egypt, Peru, Japan, and China to interview an array of Chinese and overseas scholars and experts. The crews have also made extra research attempts to Mount Ararat and its surrounding areas and have gathered a lot of relevant information. 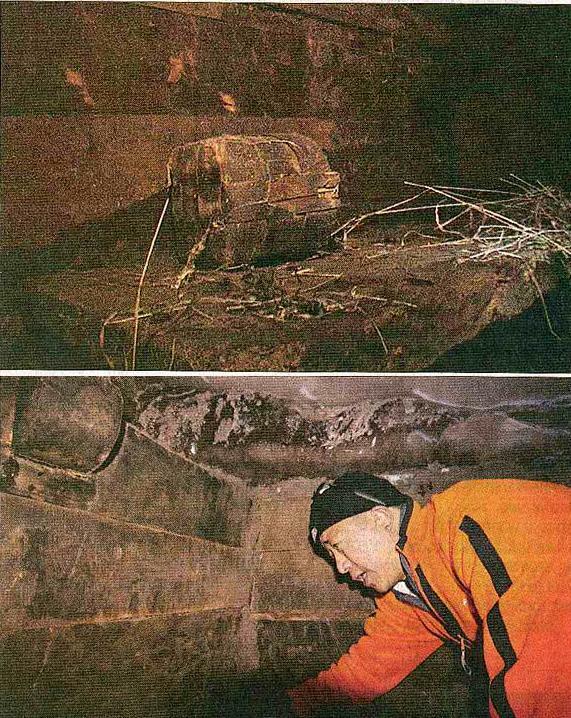 The site also tells us that in August 2008 “they received a collection of photos which were suspected to have been taken inside the ark.” The NAMI website also has screenshots of a number of recent media reports (mostly in Chinese) on the supposed discovery, including a couple of photographs showing the inside some sort of (rather cramped) dwelling. There’s even some straw lying around. The site also carries a triumphant announcement: “Turkish government officials to apply for UNESCO World Heritage Listing”. A panel of experts, comprising Turkish authorities, veteran mountaineers, archaeologists, geologists and members of Hong Kong-based Noah’s Ark Ministries International, also displayed an almost one-metre-long peice of petrified wood before the media and specially invited international experts. The experts claimed it to be a part of a long structure they had unearthed during their February-August 2007 exploration. “It is for the first time in the history of the Ark search that an exploration team is getting a material evidence and graphic documentation. This makes it not only a the significant breakthrough in the Ark-search, but one that is supported with the most substantial evidence in recent history,” the panel said. “The structure was discovered in the interiors of an unusual cave. The11.5m wide and 2.6m high white wooden texture was revealed after removing thick layers of volcanic ash on the cave wall,” panel members said at a press conference. The exact location remains secret, for reasons of “preservation”. NAMI also runs a Noah’s Ark theme park in Hong Kong, which includes a full-scale ark built to Biblical dimensions; the project was financed by Hong Kong’s “three billionaire Kwok brothers”, who own Sun Hung Kai Properties Ltd. The Media Evangelism, meanwhile, is advertising some sort of exhibition entitled “Lost in the Noah’s Ark” with this bizarre poster. It is nice to be so sure, isn’t it? So carbon dating is OK for old pieces of timber, but it’s not OK for dinosour fossils? How convenient. carbon dating is very accurate but isn’t genenerally used for dinosour fossils despite what media always reports.. it only has a half life of 30 thousand years so is only accurate for dating up to 80,000 years old assuming rate of decay has been constant. but I reckon this report is fake. So a fossil in the sedimentary layers should show no carbon 14 whatsoever but bits of wood and fossils do. This is why evolutionists dont like C14 dating so much now. John, c-14’s half-life is ~5760 years, not 30,000. Accelerator Mass-Spectroscopy can allow samples as old as ~100,000 years to be dated via c-14, though it’s very hard to do for very old samples without contamination. charles allan, C-14 can be present in sedimentary layers due to transmutation of organic matter in the sediments by natural radiation from uranium and other radioisotopes. The amount is very small and so usually dates at ~40,000 years ago because the level is so low. It has nothing to do with the claims made by “Flood Geologists” for young sediments and isn’t found in ALL sediments containing organic matter, merely those with sufficient amounts of radioisotopes. called Navarro and his son walked around part of the Ark and brought back photographs and a piece of wood . The wood dated correctly. Coal Oil Gas and diamonds date around 40,000 years. is by a massive flood. It has to be killed quickly and covered in sediment. There are billions of fossil animals killed instantly in the layers. from say coal – not all around 40,000 years. No Charles. “40,000 years” is the old ‘default age’ when the C-14 in sample was detectable but too low to be measured accurately. Thus all samples with just detectable traces of the stuff come up as “40,000 years”. Newer AMS C-14 readings of such contaminated samples would probably be in the range 50,000-100,000 years ago, but AFAIK no one has wasted money testing such things to such “accuracy”. Spurious measurements are pointless for real geology. They only excite YECs like yourself – real geologists have better things to spend lab budgets on. Wow, the atheists are scrambling at this news… as for the argument of other civilizations existing at high altitudes… how many of them had carried heavy lumber up a mountain like this to do it? Or do they build using “local” material such as rocks. People will always do what is easiest. Dragging lumber up a treacherous mountain to build a house makes ZERO logic to me, especially when you have all that rock laying about and caves you could live in. I though science was supposed to be logical. No, Dell, we’re not scrambling, we’re laughing. Another Ark scam! Another scam?! Has there been a previous one? Can you name it? I honestly believe that Religious or not, THE ark or not it is still a great find because of the condition it is in & the fact that so many people are so stubborn to say Yes or No of what it is no one really realizes that possibilities are out there whether or not it is the ark. Plus Science is not always right & human error will ALWAYS be there to “prove’ or “disprove” what anyone found. If someone came out and said that this was an old civilization before the ark thing was published everyone would be scrutinizing the same thing. except it would be against Archaelogists & historians. I suggest that we open up ALL possibilities until it is DISPROVEN. because no one knows till it has. Absolutely right, Erin. Whatever’s up that mountain may not be Noah’s Ark but it may be a wonderful archaeological discovery none the less. We should all give it the benefit of the doubt until it’s proven genuine of not. That Kurdish family just cashed in big time. These evangelicals are great at picking the pockets of the rubes, it’s good to see someone doing it to them. That’s a quote from Randell Price’s letter but that’s only what Price thinks – and he may be wrong. Perhaps he is peeved that someone else has made the discovery. If this be a hoax then it must sure be a good one, afterall who would want to cart all that wood up Mount Arafat and make it into some kind of cubby house? It would be much easier to just leave some old beams lying around to be found – but then again maybe this is not a hoax. in an earthquake. It was reported in the national newspapers at the time and I don’t think it was a spoof. Copies of the papers should be on the internet somewhere. Cheers – Genesis believer. Darwinism is a huge hoax, and Genesis history is demonstrably valid, please refer to category Ages of Things at http://DancingFromGenesis.com. Ararat is composed of pillow basalts, deposited into water, there is a great hint for the dumbfounded. Darwinism is the hoax? The millions of man-years of work by geologists compared to the couple of centuries by a few YECs who actually do any scientific work… yeah that makes sense… NOT! Satan loves this Trojan Horse… gets habitual lying and self-delusion main-lined straight to the hearts of Bible-Believers… the Lie, contra Ken Ham, is YECism. So bring in 500 of the top scientists and let’s see what is there. Preservation is obviously not a problem unless you want to make a Jurrassic Park out of it. Good, it was really about 4,350 years ago. Funny (if not so sad) that pastors are not talking about this from the pulpits. What are they afraid of, their own ignorance? Hassle your pastors about this, the time has come. Excellent work man ur great. IF the ones that found this so called Ark are real Christians, then the found is genuine. Because you see, REAL Christians cannot lie or deceive… The ones that say that are Christians, and do this sort of things, are not really Christians, but atheists. Because if you are Christian you believe in God. If you believe in God then you believe in His words. And if you believe in His Words you will have them written in your heart!!! And if you have them written in your heart, you cannot do this sort of things. So if the founders are REAL Christians then the found must be true! And it remains only one question: if the found is the Ark, or another type of wooden structure. Christians aren’t perfect – just forgiven. And deluded it seems, especially by their own “willingness to believe”. But it’s irrelevant whether the Ark is ever found or not. A look through Mesopotamian history indicates the whole region believed in a massive Flood at some point in their not too distant past. Who knows what it might’ve been? But Not a Global Super-Flood required by Flood Geologists. Reality isn’t so absurd. That one guy… who corrected john… he’s really smart.